Open water swimming is supposedly one of the fastest growing sports around the globe. I am not sure where I heard this statement, and it is probably not true, however, the fact is that open water swimming and triathlon are becoming very popular. If nothing else, just the simple fact that there is a market for enjoyable open water swimming holidays all around the globe is a good indication that the sport is gaining traction. And since, 70% of our planet's surface is covered by water, it only makes sense we'd discover it sooner or later :). With the increasing popularity of open water swimming popularity,there also comes quite a big challenge for open water event organizers and for swimmers themselves. The open water events organizers struggle to make sure that swimming events are safe and many swimmers have a hard time understanding that swimming in open water is not the same as swimming in the pool. New swimming skills and an understanding of the environment are required in order to fully enjoy mother nature's outdoor liquid wonders. I've sat down to discuss some open water training tips with one of my friends from my younger years in the Czech Republic, who has gone through the difficult transition from wall to wall pool swimming to a very successful world wide open water swimming career. Meet Rostislav Vitek (Rosta), a 2008 Beijing Olympic participant, English channel swimmer, multiple Czech record holder in open water races and one of the world's top open water swimmers. In fact, Rosta is an extreme marathon swimmer as he loves participating in events, such as the Argentinian 57km swim from Santa Fe to Rio Corondo. He has won this event on a few occasions. Just to bring his achievements into perspective, he swam the 4th fastest English Channel Swim time (7:16,25) in the history of the La Manche crossings. Now these are credentials any swimmer would be proud of. Swimator Blog: What would be the first tip to give to someone who is just starting out or thinking about joining in the open water and triathlon frenzy? Rosta: At the beginning you need to swim a lot in open water. I know this sounds simple, but just going for a swim in your local lake or pond instead of being in the pool makes a huge difference. Spend some time in open water before going to your races, so you get accustomed to the different environmental conditions (wind, water temp, rain, waves etc.) as well as reliance on yourself and not the swimming pool walls. 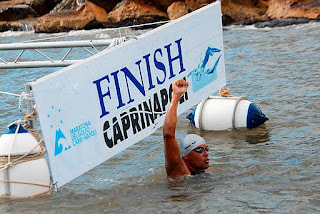 Usually, whatever conditions you swim in at your home open water hole, you will be comfortable when swimming in a race. Just to give you some perspective, I spent three years plowing the open waters back and forth before I felt comfortable during my races and I started to understand the open water environment. After that I could migrate back into the pool and only use my races as my open water swims. However, to leave out practicing in open water, you would need to go to a race almost every week, so this is not for everyone. Swimator Blog: So what sort of things should a person do in open water? Obviously, not just mindlessly swim as fast as possible. Rosta: For sure, open water swimming has a lot of nuances that the pool swimmers don't know much about. For example, sighting. Sighting is the process of raising your head out of the water to look where you are going during your swim. The idea is quite easy to understand, however, the hard part is to figure out how often to sight and what to look for. You can practice different sighting intervals until you figure out what is a good one for you, so it does not necessarily slow you down and make you more tired. One way to do this is to count your strokes in between your sightings, so for example, you can sight every 50 strokes to begin with and see if you can keep a straight line. With sighting also comes the experience of knowing what to look for. The most common mistake is to look for a floating buoy or something on the water, however this technique does not work. You need to pick a large object (house, tree, TV tower etc.) in the distance in the direction you are swimming before you begin a race and then just quickly look for that object during your sighting while swimming. There are many other things you also need to think about and consider while in open water, for example how to breathe, how fast to move your arms, when to eat etc. Swimator Blog: That's a good advice. Should you have any tactics during a race or how does racing in open water differ from swimming pool racing? Rosta: Well, in the swimming pool, it is just you in the lane with nobody around, so you have to rely on your speed. In open water, it is not so much about who the fastest person is, but about who is the smartest tactician. Obviously, you do have to swim fast to be with the best, however, you don't have to do it alone. In open water races, and this is very hard to get used to coming from the swimming pool, you should attempt to swim in a pack of swimmers so you can utilize drafting. If you swim alone and employ the same tactic as in swimming in the pool, you will be doomed. Just pick a group of swimmers that have a similar or a bit faster speed than you and stay inside the pack. It is the same principle as in cycling. So, sometimes you need to conserve your energy by letting someone else do the work, instead of letting your competitiveness get the better of you. However, in shorter triathlon races, this is a bit different. For triathletes, your race tactic will depend on how long the swimming part is and on how good of a swimmer you are. Either you will just fight to survive the swim, in this case, you should heavily invest in improving your swimming technique or you will cruise to the end of the swimming leg with plenty of juice left to continue with the race. While swimming in a triathlon, you do need to keep in mind that there is still biking and running left afterwards, so not much sprinting is done at the end of the swim here for most triathletes. Instead the focus on fast swim to bike transition is in sight. Swimator Blog: Ok, the drafting makes sense. Very hard to get used to coming from the pool though :). It needs a lot of practice. You mentioned that for someone starting out in the open water sport, swimming in the open water should be the main aspect of their training. Do you recommend leaving out the swimming pool altogether? Rosta: No, not at all. For beginner open water swimmers, the importance of swimming in the open body of water is not necessarily for energy draining workout purposes, but for getting familiar with the environment and learning the different tactics and techniques such as sighting, drafting, recovering, right arm movements etc. However, you can still get great preparation workouts in the swimming pool. Preferably in 50 meter swimming pools as it better mimics the open water scenario. Swimator Blog: What type of workouts should you do in the pool then? Rosta: Well, this fully depends on how skilled a swimmer you are, but you should definitely focus on your swimming technique, so your stroke is efficient. Some technique work should be part of every workout no matter how advanced a swimmer you are. Then you can simulate open water race conditions by for example swimming series of 50s. 4x6x50 or 4x20x50 (depending on your skill ability) and every set of 50s is on a bit faster interval while maintaining the same speed. So the first set of 6x50 is on let's say 1:00 interval, second 6x50 on 55 seconds etc. You need to maintain the same time for every 50 even with the lower interval. This simulates how your body gets more tired during the race and also the sprint towards the end of the race to the finish line as that is where most of the races are won or lost since drafting tactics are used. It is something called the "endurance speed". Swimator Blog: Would you recommend the use of any swimming gear for the open water swimmers or triathletes? Rosta: If I really have to choose, I am a big fan of technique oriented swimming gear, so my number one recommendation would be the front snorkel. This tool is great for getting your body aligned and keeping you in the rhythm while also improving your lung power. As far as other swimming gear products currently popular among triathletes and open water swimmers, such as paddles and fins, these are not necessary. I would not recommend using these unless you already are a pretty good swimmer as this type of gear can cause more harm than benefit with a bad technique. You are much better off doing some technique work. These were just some introductory tips from Rosta about how to get started with open water swimming. If you have any specific questions you'd like to ask Rosta, please feel free to put them in the comments as this is a unique opportunity to gain inside knowledge on open water swimming from one of the best open water swimmers in the world. I will bring more insights from Rosta's vast open water experience in future open water posts, so stay tuned and don't forget to join our growing Swimator Facebook community or follow us on Twitter @360swim. Thanks for the guidelines. I never tried to swim at open water and I don't have the guts to this. This article is really a great help. These tips are beyond helpful! Swimming is my passion, but I have yet to try to jump out of my swimming pool into the open waters.